This edition of Friday Night Photos is definitely for people in Utah, but others are welcome to play along. Here in the Beehive state, a certain type of taco salad is hugely popular, and now there are two competing local chains, each with their own taco salad version. First on the scene was Cafe Rio, and despite the fact that I’ve never gotten around to adding a photo, the post where I share the recipe that was given to me for Cafe Rio Creamy Cilantro Dressing is one of my most popular posts. Above is your basic Cafe Rio Salad, a layered concoction of flour tortilla, black or pinto beans, rice, seasoned chicken, lettuce, guacamole, chips, cilantro, and salsa. Everyone in Utah loves Cafe Rio Salads. Here’s my South Beach Diet friendlier version of Cafe Rio Salad, with no chips, no rice, and I don’t eat the flour tortilla most of the time, although now they have whole wheat tortillas, so that might change. Here is the Bajio version of the same salad, essentially the same ingredients although you can’t see the guacamole or salsa in this photo. Interestingly enough, I didn’t realize the bowl was that mettalic fuscia color until I took the photos. Here’s my South Beach Diet friendlier version of the Bajio salad, with some Cojita cheese adding a bit of extra appeal. Bajio also has their own version of creamy cilantro dressing, very similar but maybe a tiny bit more spicy than the Cafe Rio Dressing. So readers, you’ve seen the contenders, now cast your votes. If you’re from Utah, which do you like best, Cafe Rio or Bajio? And if you’re never eaten at either of these places, which looks best to you? Quilt Family, glad you like the blog. I don't have any of the recipe for Bajio, but here is the recipe for Cafe Rio Dressing, Chicken, and Rice. There are a few other supposedly Cafe Rio recipes that people have left in comments on that post too, enjoy! Love the site! Do you happen to have the recipe for Bajio's vinegrette dressing they use on their Chicken Green Chili Salad?? I found the one for their cilantro lime dressing, but prefer the other one. Would love your recipe for the Cafe Rio salads!! Anonymous, I'm not sure if the Cafe Rio tortillas are 100% whole wheat; I kind of doubt it, but I think they're okay for a treat once in a while. I usually get a salad with a whole wheat tortilla and no rice when I go there. Thanks so much for mentioning that Cafe Rio has whole wheat tortillas! It never occured to me to ask, so I always just figured they were off-limits to SBD-er's. Today I had the salmon tacos, and they were fabulous! Now I'm going to have to try out Bajio and decide for myself! Only been to Cafe Rio a few times, and I LOVE it. In California they've got their own versions as well. While my family loves Chipotle, they've never been to Cafe Rio, which wins in my opinion. Though I do prefer that you don't feel as rushed with your order at Chipotle. I had to put in my two bits. Both are very good, but I actually prefer Bajio. My favorite items there are: the Pineapple Shrimp salad, which is amazing, their vinaigrette dressing, so yummo, the mild tomatillo green sauce, Shrimp tacos, tortilla soup, sweet onion rice, black beans or refried beans (can't stand the beans or rice at Cafe Rio), Chicken Green Chile salad or Chicken Green chili Quesadillas. The green chile chutney is awesome and they don't have that at Cafe Rio. I even like their tortillas better, although I'm not sure what is different. I really liked the pork at Bajio when they first opened, but I don't much anymore because they changed the recipe, and now I think it tastes like packaged taco seasoning, yuck. Cafe Rio definately has the best Pork. I think overall, Bajio has a fresher taste and a much more diverse menu. Probably my favorite Mexican dish is tamales, and the tamales at either place are fantastic, but they are only available one day out of the week and I never seem to remember when that is. Different places for different things. I love Cafe Rio Steak burritos, enchilada style. Bajio has very good fajitas, and the shrimp tacos are to die for. LOVE THEM. Especially with the mango salsa. Cafe Rio's salads are to die for. Anyone remember Durango Grill in Orem and Provo? Their salads, I thought, were comparable to Cafe Rio's, but Cafe Rio definitely had the better atmosphere. I must say, though, that Bajio's shrimp tacos, black beans, and rice are soooooo good. Does anyone have the recipe for the shrimp, beans, and rice? While I'm at it, I really miss Rosa's that was next to McDonald's on University and Bulldog in Provo. They had the best Chicken Mango Salad. It had green chile chutney and carmelized onions. I NEED that recipe too! I no longer live in Utah, but I always make sure I go to Bajio's several times when I'm there. I love Bajio’s tacos. Their meat is seasoned better than Rio’s, so are their black beans. 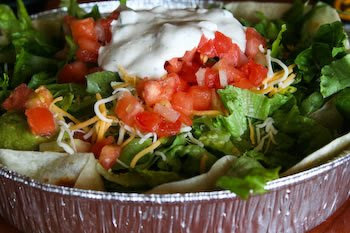 But, for some reason, the salads are always better at Cafe Rio. Lots of Cafe Rio fanboys/girls! 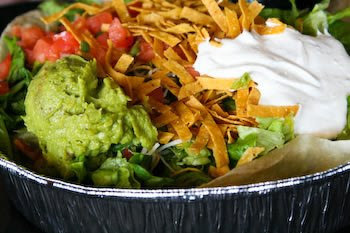 Have to agree about the two salads though, Cafe Rio is better, BUT nothing compares to Bajio! Their sweet rice and the corn and the sweet onions….I would fly back to Rexburg, ID right now just to get some! Also, Bajio’s meats can’t be beat – so good! And the shrimp tacos with mango salsa…oh man! Both Cafe Rio and Bajio are good but the BEST in Utah is a single fresh mex restaurant in St. George named “Durango’s”. Their marinated, grilled chicken salad with spicy tomatilla dressing is to die for. If we ever move from this place I’ll be making regular trips back just to pay a visit to Durango’s! (By the way, if anyone has the recipe for Durgango’s please post it, I’d love to have it! COSTA!!!!!!!!!! the Winner hands down. Esp the one in South Ogden, the food is good the staff is friendly. I have a love for the Mango chicken. I have tried the others and the are fine but not as good as Costa Vida baby! Costa Vida is my vote…especially since they add something that neither of the other restaurants do: mango! That makes it a hit for me. Well I’m trying to remain neutral in this whole thing, but I’d say Cafe Rio is winning by a mile! I do love their salad, but I like Bajio too and look forward to trying Costa Vida as well. Definitely Cafe Rio. I get the salad with the cilantro dressing every time I go. Yum!! I really don’t like Bajio at all even though they look similar. Bajio. Love the corn and onions. Half Baked, those cards are a great marketing idea for Cafe Rio. I’m not someone who usually bothers with that kind of thing, but I do have my Cafe Rio card in my wallet at all times! I love Cafe Rio! It’s one of the many things I really miss since moving from Park City. I still have the frequent diner stamp card in my wallet…just in case:)I’ll be making your version for sure!!! A taco salad from either would be incredible right about now! Yum! Cafe Rio, but Costa Vida is a close runner up, I don’t go to Bajio ever. That looks so yummy! Thanks for the great pictures and recipe! Oh, Kaylyn, there is absolutely NO CONTEST…Cafe Rio RULES! I have tried Bajio and Costa Vida…couldn’t even finish my Costa Vida wanna be food. I have to laugh at reading your blog. I was just getting a long-awaited pedicure in St. George this morning, and my wonderful pedicurist only lives a few blocks from a Bajio. She told me she was craving a chicken enchilada the other day, but didn’t want to drive clear to Cafe Rio. So she decided to try Bajio. She ended up giving her food to her dog. She is a Cafe Rio loyalist, too! My daughters who live in Colorado have to visit Cafe Rio whenever they come to Utah. Their food is perfection! Thanks Maria. I’m definitely going to try it. (You can tell I don’t get out much, LOL. Never seen it at either of those places or even heard of it. Good thing I have you guys to help me attempt to stay up on things! I meant costa vida! Sorry for the typo! There is one at the gateway and foothill village. Doodles, I agree, homemade taco salad is great. It’s something I eat for lunch at least once or twice a week. Having been to Casa Vida (?) and Cafe Rios only once on a visit last summer I really like them both……..but I also like my version as well. I like the looks of your South Beach Diet friendlier version of the Bajio salad, with some Cojita cheese and the creamy cilantro dressing! The Cafe Rio salad looks like what we usually have here in Roanoke, VA. So now I have to wonder if what Maria is calling Costa Visa and Costa Vida are the same? Definitely will check on this place. I have to admit that I MUCH prefer a write-in…. Costa Vida. I find their flavor much more enjoyable. Jen, I didn’t know about the side of rice and beans, sounds like a great option for kids too! I see Cafe Rio is winning so far, although I have to say they’re both very good. I wish I had some tips about the Red Iguana secrets. I’ve begged them for the secret to their Chile Verde, but no luck getting a recipe. I haven’t been to Costa Visa, have to look for it. The recipe for Cafe Rio dressing is really good, but if you’re not a cilantro lover I don’t know how much you’d like it. They do have another dressing option, but I think it might have cilantro too. I think without the cilantro and lime it might be similar to Ranch Dressing, which would be good on this salad if you didn’t like cilantro. Hmm, now I’m craving a salad! Cafe Rio’s, and your version of it look the best, but I’m not a huge cilantro fan, so I’d have to taste that dressing first – I know, I speak heresy to the Cilantro Queen. What I’d really like is the contract selling those cute foil containers that appear to be an e$$ential ingredient! i don’t live in utah, but that pink bowl is BRIGHT! Bajio has always tasted a bit fresher to me. But Cafe Rio’s tortilla is better. Now that I haven’t been eating tortillas for about a year, I definitely lean toward Bajio. I like your Cafe Rio the best! Cafe rio is my favorite! I always get the veggie salad. Bajio is ok but I prefer rio. Josh actually likes costa visa another similar place. I don’t live in Utah but we try to visit Cafe Rio every time that we visit. I can’t wait to try your version!!! I think taco salads might be the perfect winter pick-me-up – tons of flavor that always fills you up. Now what I am looking for from Utah is the secrets of the Red Iguana – it’s been a few months but I am still thinking of my dinner there! Cafe Rio …all the way!